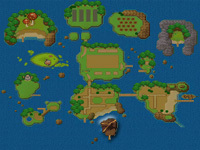 The mine where you find ores and jewels is located on Volcano Island. You need to use 8 Sun Stones to unlock. Once you do, the mine is accessible all year round. You need to raise Volcano Island if you want to meet Will and Lily. They are both interested in the island; Will is associated with Regis' mining company, and Lily wants to search the mine for treasure. The mine is 255 floors deep, but you can not decent down to the bottom floors right away. You need to work on your Mining Degree to earn the right to reach the deeper parts of the mine. You can increase your Mining Degree by doing mining-tasks such as shipping ores, smashing rocks in the mine, falling down holes, and winning the Mining Festival on Winter 19. You can move down through the mine by finding the staircase down to the next floor (by using your hoe on the ground) or by running over a hidden hole. The holes will send you down between 1 and 5 floors. As you fall down a hole, your Stamina will decrease. If you fall down a 5-floor hole, you will lose 100 points of Stamina! If 100 points is the maximum amount of Stamina you have, then you will pass out when you land. To temporarily increase the amount of Stamina you can have, get the H. Goddess Pendant from Charlie. The little boy will make you a small effect pendant for just 10 Orichalcum ore. Since the mine is located inside of a volcano, you will find lava bubbles on most floors of the mine. 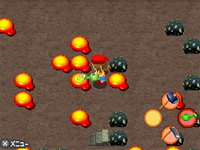 The lava can make it difficult to locate the drop holes or staircase. You can jump over the lava and it won't hurt you, but you can destroy it by sprinkling water on it from your watering can. If you water the lava three times, you could receive Gelatin. Gelatin can be used as a cooking ingredient or given away as a gift. Some floors in the mine have more lava bubbles than others. Most floors divisible by 10, such as 30 or 150, don't have any lava on them at all. Then there are floors 100 and 200, which are nothing but lava bubbles! Since there is no where in the mine to refill your watering can, make sure you fill it up at your farm before you go mining. It also helps to attach an Orange Wonderful to your watering can so it can hold more water. Before entering the mine, look at the pool of lava on the left edge of the island. You have a 5% chance of getting a stone from riding Kirk's boat to the island. When digging using your hoe on floors 50, 75, 100, 125, 150, 175, 200, 225, and 250, you may come across a Stone Tablet. This item is only worth 1 G if you ship it. These tablets are used to increase your Mining Farm Degree. You will earn Mining Degree points every morning based on the number of tablets you keep in your rucksack and the year you are in the game. For example, if you have 5 Stone Tablets and you are in year 3, you will earn 15 Mining Degree points every morning (5 x 3 = 15). The Stone Tablets stack, up to 99, so they only take one slot of inventory space in your rucksack.